Find out what President Trump has said about where you live since he became US president. That is the end of our live coverage of President Trump's visit to Scotland. Thanking those who took part for their "good behaviour", Police Scotland estimated that 9,000 people were at the Edinburgh anti-Trump demonstration. Organisers think the true number was up to 60,000. Nicola Sturgeon has denied that she has refused to meet the US president during his visit to Scotland. The Scottish first minister, who earlier took part in Glasgow Pride, said her disagreements with Mr Trump were "not personal - it's about policies". She said: "If the opportunity arises to meet the president I will do that and I'm sure if the opportunity arises in the future we will have lots to talk about, including the close and very important links between our two countries. "In democracies, it's also important to be able to focus also on where we perhaps disagree, and lots of people disagree with the policies of the Trump administration. "It's not personal, it's about policies. "Policies like pulling out of the climate change treaty, the treatment of minorities, the language about women, but also, and I think most importantly recently, the policy of separating migrant children from their parents. "As in any relationship, it's important to have the ability to be honest as well and I think most people in America, just as most people in Scotland, would agree with that." What can we take from President Trump's visit? This is how it works in Trump world. The US president arrives at a party, causes a fuss, breaks some crockery, and leaves everyone stunned. Then as the dust settles, he declares what a good time he has had, how it's all been a great success, while offering a few words of apology for the disruption caused. So it was at the Nato summit, and so it was during his visit to Britain. Read more from James Landale here. Nicola Sturgeon says she is a "wee bit tickled" by comments made reports that Donald Trump has been "bitching" about her to Theresa May. Earlier this week the Huffington Post quoted a former UK government aide who said the US president "spends lots of his time bitching about Sturgeon" in phone calls to Mrs May. "If it is true, I suppose I should take it as a compliment. I certainly don't spend that much time talking about him." We want to send out a message to the people of America who are watching this, to the people right across the world who are watching this that the people of Scotland do not consent to Donald Trump's visit and we stand for values of hope, common humanity and the ideal of world peace. We want a very different kind of world than the one that Donald Trump seems to envision." 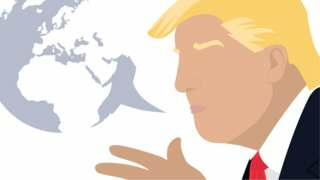 Donald Trump's first visit to the UK as US president has not been without its drama. From an explosive interview with The Sun to the protests and an inflatable Trump baby, there have been some memorable moments. Read more about how the visit panned out here. Supporters of Donald Trump are demonstrating outside the US Embassy in London during the US president's visit to the UK. 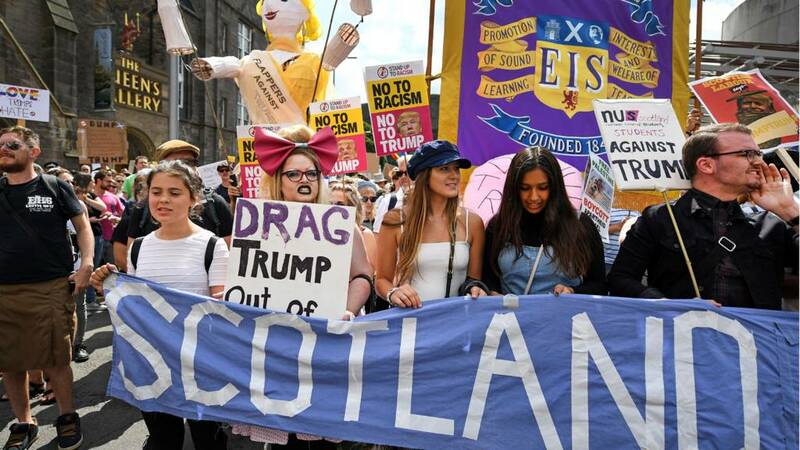 Donald Trump is no stranger to protests in Scotland. President Trump is out on the fairway at Turnberry, and plenty of protestors have gathered on the edge of the course. Among them are two children dressed as handmaids from Margaret Atwood's Handmaid's Tale. First Minister Nicola Sturgeon has tweeted her pride at leading, well, Pride. The US president has been heckled by protesters as he played golf with his son, Eric. Mr Trump waved as protesters surrounding the perimeter of the Ayrshire golf course booed him. The US president and the PM are in talks at country retreat Chequers ahead of widespread protests. In an interview with The Sun, the US president gives his verdict on the PM's most important policy. What are the rules around flying a Donald Trump balloon in Central London? What is going to happen on Trump's trip? President Donald Trump will spend time with the Queen and prime minister before flying to Scotland.